Kathy has been an aesthetician for 12 years and laser technician for over 8 years. She currently provides aesthetic services, from your fundamental facials, medical grade peels, and microneedling to results-driven laser treatments for all skin types. Kathy has been an aesthetician for 12 years and laser technician for over 8 years. She currently provides aesthetic services, from your fundamental facials, medical grade peels, and microneedling to results-driven laser treatments for all skin types. Kathy happily helps treat a wide variety of patients ranging from individuals looking for relaxation to those working on a specific skin care goal(s). Kathy was introduced to the beauty industry when she worked at a hair salon in Michigan as a teen. She then attended the Fashion Institute of Technology (FIT) in New York City; where she earned her degree in Fashion Merchandising Management. After receiving a facial treatment at a well-known spa, Kathy realized her true passion for skin care. 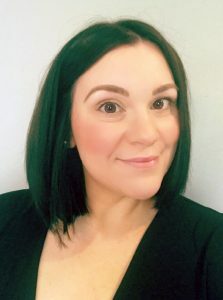 In 2007, she graduated with her Esthetics and Advanced Esthetics License from Metro Beauty Academy in Allentown, PA.
She continually advances her knowledge and education by attending seminars and classes throughout the country to bring the most current information and latest technologies to her patients. Kathy brings a synergistic approach to her work, customizing facial, peel, and laser treatments to reach the patients specific skincare needs and goals along with giving each patient a skincare regimen specifically suited for them. Her presence radiates her love of the skincare industry and she is extremely excited to join Dr. Herman and the team at Lansdale Plastic Surgery. Kathy currently holds membership with the Associated Skincare Professionals.